Ok, so I had some second thoughts after reading some of the comments from last month’s post about pulling out all stops to top up my ISA, so with just a few hours to go before the tax year deadline, I opened a cash ISA account – nowt like living on the edge, haha! I went for Nationwide Building Society as I already bank with them so it was quick and easy to open the account – interest is 1.4% (Nationwide gave me an extra 0.1% loyalty bonus – woo hoo, I guess!) and the account has limited access but I’m ok with that. Let’s see how I get on with this tax year’s ISA – I’m going to have try to top £17.5k now, aren’t I? Eek! Anyway, how did that affect my savings this month? I saved 45.3%! My average savings rate has now gone down to 51.1%. I have now booked my holiday to HK – have paid for my flight in full (most of it via my ‘holiday fund’) but my sister has paid for my ‘holiday within a holiday’ (a few days in Thailand) so I’ll need to pay her back by next month. The above savings was topped up with £1020 matched betting funds (I withdrew some cash from my betting and exchange accounts) and £68.54 affiliate income from OddsMonkey (thanks to all who signed up via my links!). The markets must have recovered a bit – after months of going backwards, my Future Fund now appears to be heading in the right direction again at £138,939, back on track towards my next milestone. £344.43 was received, my second best month so far. Total dividends this year stands at £910.53, still ever so slightly behind plan but still a way to go yet with some big payouts in the pipeline! Not a great month, even if I hadn’t made a balloon of a mistake! I lost out on £120 in profit due to a ‘fat finger error‘ – instead of laying a bet for £10, my fat finger typed £40 and I didn’t notice (should have gone to Specsavers!) – ouch! MB might be mostly risk-free but it’s not free from human gaffes! Bad runs on both my no-lay strategies (accas and EW betting) completed the dismal month – sorry, I can’t bring myself to document the stats but my profit overall was £121.55. 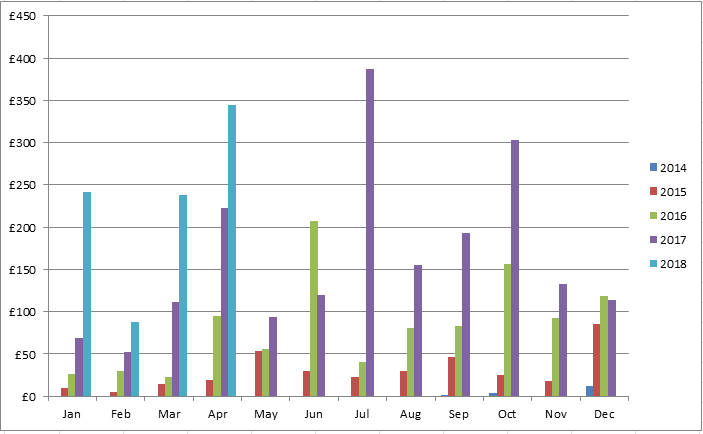 Total MB profits so far this year stand at £1,036, which is way off target for my over-ambitious annual goal. Note that there are plenty of folk who do MB who don’t touch accas or do EW Matcher betting at all but who still make regular profits from other (less riskier) offers. As mentioned above, the matched betting guide I subscribe to is OddsMonkey*. Great for beginners and experienced matched bettors alike with quality tools such as the Each Way Matcher, Extra Place Matcher, Dutch Finder, Racing Matcher and Acca Matcher. There’s also a friendly forum for you to ask questions. Anyway, check out the free trial*. Also, for those interested, you can also see how I’m getting on with my Book Bingo here – I’ve crossed off some more squares! Part of my emergency fund is with the TSB bank so it was just as well that I didn’t need those funds in a hurry due to the online nightmare this month (and ongoing), when an IT upgrade/migration went spectacularly wrong – I did try to log on several times but was unable to do so (I only wanted to check my balance). One reason it might be a good idea to have your money spread across different accounts in case something like this happens. Enjoy the bank holiday weekend (those in the UK!). This entry was posted in Books, Dividend Investing, Earnings, Expenses, Investment Trusts, matched betting, Portfolio, premium bonds, Savings, Shares, Work by weenie. Bookmark the permalink. Sorry to hear about the loss of your grandad. As a BRT payer, I certainly don’t have the same struggle regarding balancing between pension and ISA as you do, but I still don’t really know if I’ve got the balance right. My ISA is currently only half the value of my SIPPs so I need to builtd up, as I’d like to be skating under the tax allowance until the age of 65 when my DB pension kicks in. So in my mind, I should be chucking as much as I can into my ISA, yet it feels wrong to neglect my SIPPs so I really need to figure out the numbers. I might revisit when I do my five year review. I can imagine that your kitchen renovation will be a big expense (they always go over budget! ), plus the new car but don’t get the cash savings for these be mixed up with your ’emergency fund’ which is for…emergencies! I barely have anything left in my P2P, most of the cash has been transferred into my ISA. I do believe they are still good investments (and having been a Lending Works customer, I would recommend them too) but as I’ve mentioned, I just wanted to simplify my own portfolio. Weenie, nice work on the cash ISA. It should give you the flexibility to accumulate even more tax free equity investment over time, as you drip feed it across from the cash side, and at the same time maintain your emergency fund, which i may have thought (or even foolishly suggested) a couple of weeks ago nobody ever actually needs! I’ve just woken up this morning to a blocked drain, so Thames Water will be getting a call shortly. Luckily it’s a shared pipe, so the expense should be all theirs! Not the best start to the Bank Holiday, but the sun is shining!!! HAGW all. Sorry to hear about the blocked drain but yeah, that emergency fund sure does come in handy! I will, as you say, drip feed into it to maintain/top up my emergency fund. It’s been a gorgeous bank holiday for once – hope you’re having a good one! That’s a great saving’s rate Weenie! I’ve been meaning to ask – how do you maintain your OM affiliate income? Is this mostly people you know or referrals from your site (of which I am one!)? When I discovered MB I referred lots of friends but they have mostly dropped out now leaving just a couple each month. I think most people don’t realise there is work involved! My OM affiliate income is just from referrals on this blog (thanks for clicking through!). I haven’t managed to persuade any friends or colleagues to do MB, I reckon they all think I have a slight gambling problem! I could probably maximise the affiliate income, maybe post about my MB more often and in more detail but my blog isn’t really about making money (although making some is nice!) so it would be desperate times if I started doing that! Plus, if I was the dishonest type, in order to get people to sign up on my link, I’d hype up my profits, not mention the losses and like you say, talk about how easy it all is and not mention that there is time and effort involved! Hi Weenie, I always wonder how you track your dividend income? Is it on a statement from the platform you use? I’d like to track mine because I think it would be a good spur to keep investing through the times when the overall market is struggling. 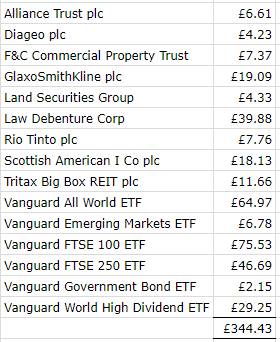 Most of my dividend paying investments are with AJ Bell Youinvest and they kindly send me an email each time a divi is paid, which I just log into my spreadsheet. The other divis are in my HL account and I used to just check the statement at the end of each month to see what had been paid. I say I used to because I’ve signed up to Dividend Max (https://www.dividendmax.com/) – they provide various subscription only investment services but one of their free services is dividend notifications – you just key in your investments, ie number of units/shares (I know this works for FTSE shares and ITs) and you get a notice of declared divis. I’ve reserved a non-fiction book at the library so hopefully will have a book to review shortly! I wouldn’t mind reading that Shoe Dog and yes, I’ll check to see if it’s at the library. Great idea to add more cash to your ISA, another step closer to freedom. I keep thinking I should have a go at matched betting as a few quid a month would help to reduce the amount I will need to take out of my ISA now I have finished working. You are really progressing with your tremendous savings rate which is way better than most people manage. Yes, I’ll keep chugging along with the savings rate – the next couple won’t be so good due to holiday expenses (one of those things I still splash out on!) but I’ll be doing what I can. The only thing I can suggest re matched betting is to just give the free trial a go – you’ll know then whether it’s something you’ll enjoy doing or not! Unlucky with the fat fingers MB error. I have done it and also done it the opposite way where I have won more than I should have hehe. It’s glorious weather currently here, going to be a warm sunny bank holiday it seems, quite bizarre for the UK eh.. I use my whole £20k ISA part from monthly investments and then at the start of the year I sell some of my shares that aren’t wrapped in my ISA. I hope to eventually have it all in my ISA, but that’s a few years away. Yes, I’ve made that fat finger error before where it’s been in my favour but only a slight favour, so it’s not quite evened out haha! This weekend has been brilliant – I’ve spent it reading in the garden in the sun – gotta make the most of it and catch some rays while I can before our summer is over! 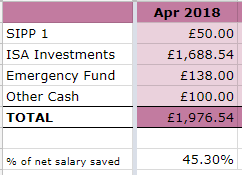 It’s great that you can use up your whole ISA – I was able to fill it up once when it was at the £15k limit and I hope to be able to do that at some point at £20k, although this number could keep going up in future years!? Glad to hear you moved some extra into your ISA – always worth while doing to help maximise the ISA allowance as much as possible, I always try to do that and it is worth it – as mentally I don’t want to take money back out! Sorry to hear about getting caught out in the TSB fiasco – hopefully that wont affect you too much but shows the advantage of spreading around your emergency cash! Yes, I’m going to try to juggle with that ISA cash now and try to make the most of it, transfer it to better accounts if interest rates improve etc. No harm done with the TSB fiasco, cheers, just glad that I wasn’t in need of those funds urgently! Absolutely – if you find you are too heavy in cash you can always then transfer into S&S – but the more to keep the tax man at bay the better! Ah that’s unlucky that you A) laid the higher amount and then B) then bet actually went and won! D’oh! I’ve had a couple of errors with the EW stuff over the last week but it’s only cost me a small amount of profit so no big deal. I still think you can do £4K in a year if you stick with the no lay EW and up the stakes as your bank goes up. Even if you started doing £5ew you could probably turn over £5K a month and at 10% ROI that’s £500/month isn’t it. I am also a TSB customer so was mildly annoyed by the whole thing but luckily it didn’t affect me at all in the financial sense. I can see why businesses and people who may have had to make payments were really annoyed though. I did get an email saying they are going to start paying 5% interest *indefinitely* as a big apology to customers… which is great! But I was left thinking, hmmm… see how long that actually lasts! Cheers for spotting the typo, TFS – I meant ‘£1020 matched betting funds’ ie I withdrew some cash from my betting and exchange accounts, although technically, it’s all profit I guess. I’ve amended the post anyway for clarification. I’m not quite ready to move up to £5EW but have moved from £1EW to £2EW so might get there in the end! I know, imagine relying solely on the TSB for all your banking, that would have been a nightmare! The 5% interest is a bonus, although still only paying on balances up to £1.5k – I see they didn’t raise the limit there!